THANK YOU so much for taking the time to answer our Weekly Update's end-2018 reader survey. And if you didn't...well...never mind. Because 2019 is coming to get you anyway! "Gloomy gold pundit foresees chaos, says you must buy gold today" is hardly a headline worth reading, I know. ...and of course a long overdue setback to world stock markets and financial assets more broadly. No, the art market hasn't blinked so far. Auction prices set fresh records in 2018. And no, gold isn't guaranteed to rise in price if these issues do spark trouble for investors. But on balance, owning a little physical bullion...securely stored at low cost in perhaps a different country...and ready to sell the moment you need...looks as wise as ever as 2019 comes into view. To recap, gold prices have held pretty firm in 2018. Trading just 5% lower versus the Dollar, gold has now risen back to last New Year's Eve for Euro and UK investors. Hence the first of our 3 charts today. It shows gold priced in the Dollar against how gold has traded for everyone outside the US currency...rebased to that cold January day in 2017 when Donald J.Trump took office in Washington DC. As you can see, the price of gold in 2017 surged in US Dollar terms compared to how it moved for non-Dollar investors. By the start of 2018 this "Trump bump" reached more than $120 per ounce. But over the rest of 2018 the Dollar rose sharply on the FX market, pulling the gold price for US investors back into line with where the metal now stands for all non-US investors. ...and interest rates rose while world stock markets set or approached new all-time record highs. Little wonder that hedge funds and other "hot money" traders bet against gold prices like never before this year. Odd that their bearish betting did so little to dent the price. That's why gold's price split from silver looks telling. The grey metal is currently down 12% for the year versus the Dollar...more than twice the 2018 drop in gold prices. And silver, of course, finds far more of its demand from industrial uses. Platinum has its own issues (the diesel scandal, a lack of output cuts in South Africa, the runaway train of sister metal palladium). But tracking the drop in silver, platinum prices have now lost 15% in USD terms since New Year's Eve. That also suggests industrial activity worldwide is weaker than when we began this year. The gold price in contrast has found support from 2018's worsening geopolitical backdrop. Hence the reluctance of current owners to sell. But strong new buying remained absent. So what might spur a fresh surge of investment? "War," says more than one cheerful soul responding to our end-2018 survey. "Systemic crisis...recession...Brexit calamity...monetary collapse," add other care-free readers. And against those happy reasons to buy and hold, what might drive Update readers to sell all of their precious metal? "The second coming," says one wag. ...while the single most common response was "Death". If you can push on through to January, dear reader, we'll look in the New Year at how to prepare for that happy day...arranging things to make a sale or transfer a bit smoother for your relatives. You'll remember, for instance, how no central bank anywhere cut interest rates in September...the first such month since before the global financial crisis. No one cut rates again in October...nor November. ...and Mozambique did the same last week. A straw in the wind? Gold and the other precious metals pay no interest. So other things equal, higher returns on cash-in-the-bank make gold look less appealing. Other things rarely stay equal however. Most important for bullion is the pace of inflation in the cost of living. 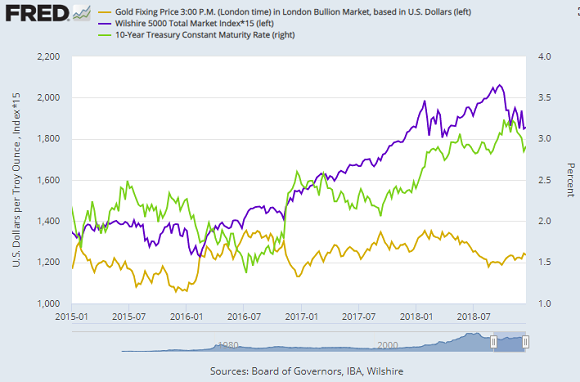 It shows gold versus the rate of interest offered by 10-year US Treasury bonds, adjusted by how interest-rate traders think inflation will run. 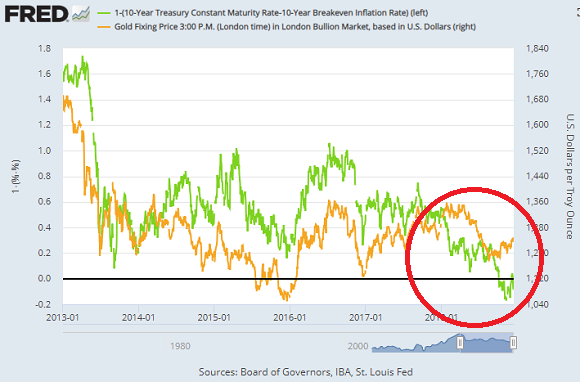 To show how it tends to move with gold prices, the real 10-over-10 rate is inverted...crudely...by deducting it from 1. ...meaning that real interest rates actually crept above zero this autumn for the first time since 2011. Still with me? Pay attention then to gold's response. 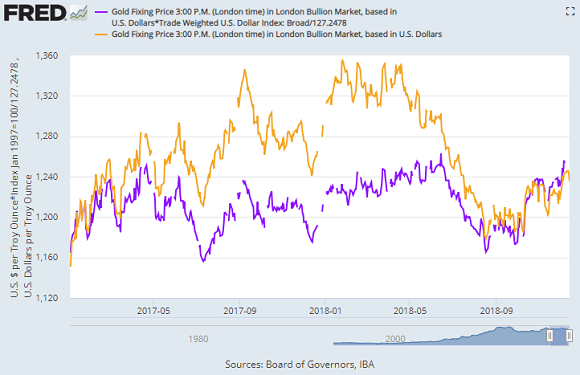 Because instead of sinking as real US rates rose positive, gold first held its ground even against the rising US Dollar in the first half of the year, and then edged higher over the last few months. ...certainly not higher interest rates in real inflation-adjusted terms. The so-called "yield spread" has become "inverted" on 3-year versus 5-year Treasuries, while the more closely-watched spread of 10-minus-2 year yields has fallen nearer to zero than any time since right before the global financial crisis. Take note: The US Fed meets tomorrow and will announce its December decision on Wednesday. ...and no doubt earning a fresh Twitter-storm of abuse from the Commander-in-Chief in the White House. ...especially as lots of other economic indicators are saying that the long US expansion starting with the huge QE and zero-rates stimulus of New Year 2009 is starting to flag. We'll find out what Powell thinks in Wednesday's press conference and "dot plot" forecasts. But the chances of 2 or more Fed hikes in 2019 have sunk according to traders betting on the interest rate market. This time last month they saw a 73.0% chance. Now that's fallen to 55.2%. Over in the Eurozone, great comic timing yet again, with Mario Draghi's team at the ECB finally ending new QE...and threatening maybe to raise interest rates sometime next year...even as inflation slows and the ECB itself cuts its GDP forecast for the 19-nation economic bloc. The Bank of England here in London meantime faces a certain "risk event" in March 2019 which will, I think, only stop UK interest rates falling back if the Pound hits a genuine currency crisis...sinking on the FX market as everyone tries to get their money out. More happy thoughts, I do hope you're enjoying all this. So net-net in 2019 for gold? It's hard not to expect continued or rising support from geopolitics...plus a weaker challenge from stock markets or rising interest rates...both of which failed to dent the metal much in 2018 anyway. Nor did the Managed Money's big, ineffectual 2018 bearish betting against gold. Or so it seems peering down on the glistening Thames from here at BullionVault today. ...plus full results from our latest Update reader survey. Back on Monday 7 January. Until then, please do try to spare friends and family your own oh-so-cheerful 2019 outlook. Trust me, I know it won't be easy.